The Numbers are in. Digital OOH works! 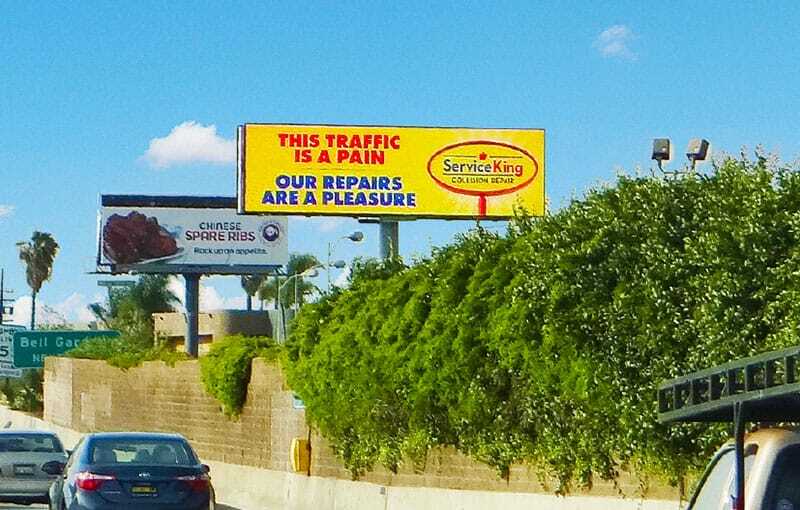 In 2014, Service King acquired existing collision repair centers and re-branded them as Service King locations in markets that had no prior awareness of the brand. 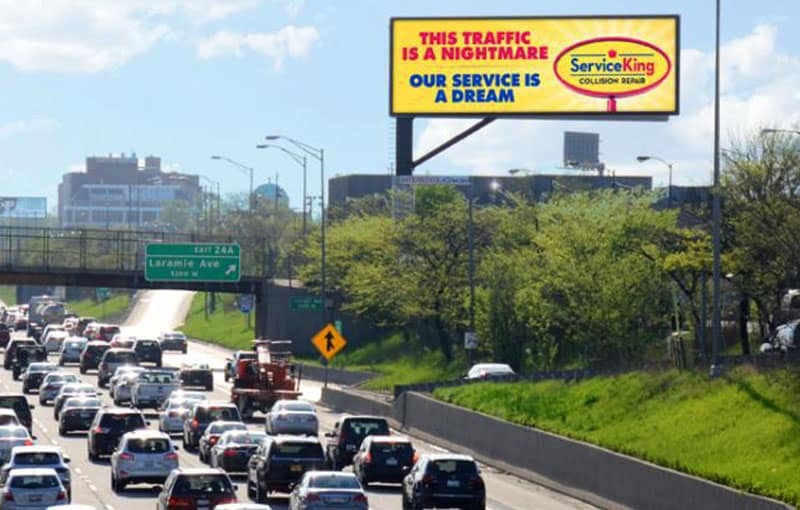 To create immediate awareness and communicate to drivers why they should choose Service King, and wanted to reach those drivers when they are most inclined to think about auto repair – while inside their vehicles. How do you introduce a brand into new markets and and boost awareness of nearby repair centers? Use digital OOH correlated with real-time traffic conditions to display hyper-targeted ads. A hyper-targeted message allowing Service King to display its ads only at times of heavy traffic. Displaying the message when there was a collision within close proximity of the displays (proximity was defined as within 0.25 to 3 miles, depending on market). The entire network of DOOH billboards was located within 10 miles of a Service King location in order to keep the messaging relevant within the markets and help drive traffic. The creative messaging smoothly rotated between lines such as “Unlike This Traffic, Our Repairs Move Smoothly” during heavy congestion and “This Traffic is One Thing We Can’t Fix” in extremely heavy traffic conditions. 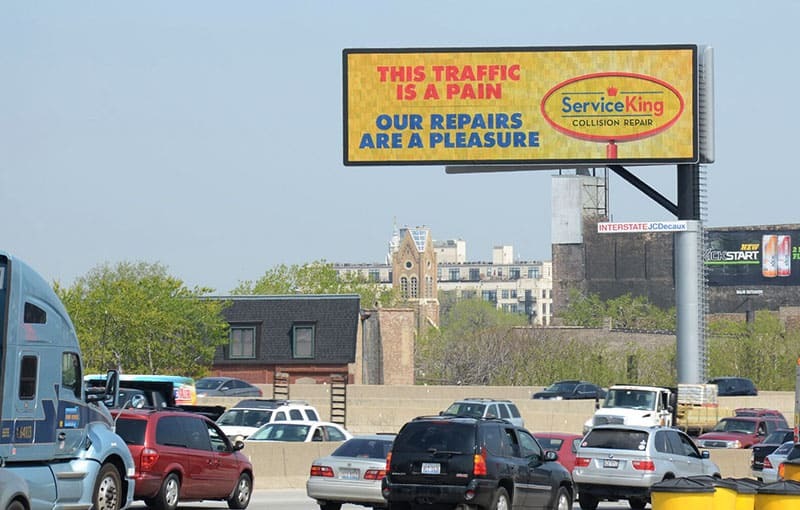 After the first week of running the traffic triggered ads, the planning company noticed a significant increase in performance of their paid search campaign, signaling that the OOH digital boards were further driving awareness of the Service King brand. The click-through-rates for the markets running traffic triggered OOH increased significantly compared to before the campaign started. Book your digital OOH campaign now!